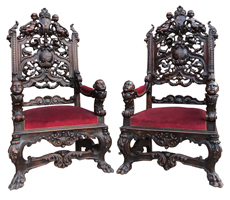 A Fine and Palatial Pair of Italian 19th Century Renaissance Style Carved Walnut Figural Throne Armchairs. 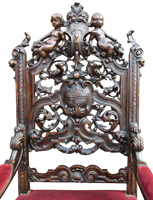 The intricately carved baroque frames with the backrests depicting a pair of resting Putti above foliage, scrolls and acanthus, centered with a carved Nobel Family Crest. The upholstered armrests ending with carved figures of winged cherub heads raised on scrolled supports. The conjoint legs with a carved front apron and paw feet. Circa: 1890.